'Hearty Burgundy' (Keith Keppel, R. 2011). Seedling# 01-94A. TB, 40" (102 cm), Early midseason bloom. Standards port wine (M&P 56-J-12), slight brown cast toward base; style arms rustic brown (7-H-10/11) lightly shaded port wine; falls darker than port wine (56-L-12); beards mustard orange, florida gold (10-L-8) in throat; velvety. Seedling# 96-57A: (seedling# 92-85A: (seedling# 89-67A: ('Faraway Places' x 'Witches' Sabbath') x 'Night Game') x seedling# 92-84A: ('Night Game' x seedling# 89-152A: (seedling# 86-41B: (seedling# 81-17A: ('Winemaster' x 'Congratulations')) x 'Faraway Places') x seedling# 86-40A: ('Faraway Places' x 'Heathen')))) X 'Regimen'. Keppel 2012. 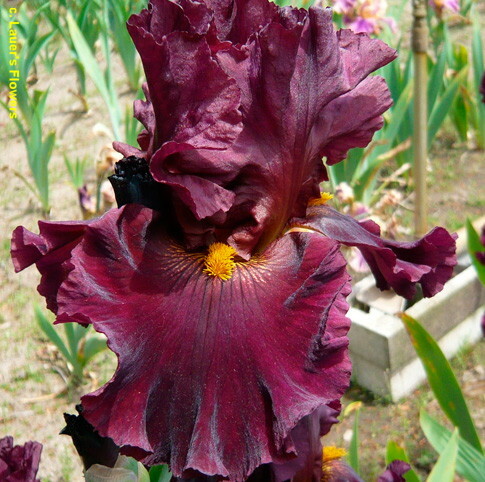 Hybridizer's Comment : Smooth, dark blackish portwine red, falls with a velvety finish, beards mustard orange. Lightly ruffled and waved. Ease of growth and vigor, plus well branched stalks (at times up to eleven buds!) were strong factors in selecting this one for introduction.